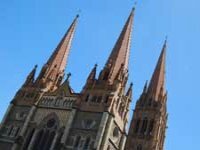 Have a look at some of the Melbourne photos I took while carrying out research for this website. 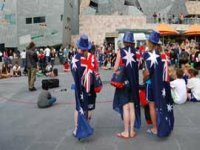 A Federation Square busker being watched on Australia Day. 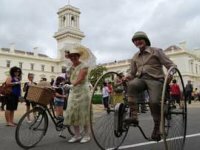 Australia Day at Government House with costumed bicycle riders. 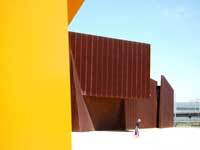 A contemporary building for the Australian Centre for Contemporary Art. 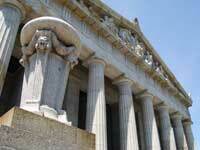 A close up view of the Shrine of Remembrance. 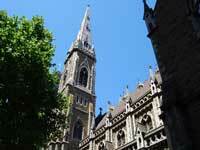 A view of Scots Church, Collins Street. 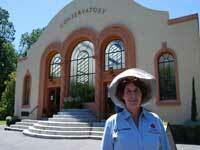 Sue, my guide at the lovely Fitzroy Gardens. The Conservatory contains gorgeous flower displays which are changed 5 times a year. 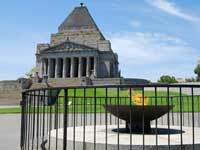 The eternal flame at The Shrine of Remembrance. Amazing pre 1900 boomtime Melbourne architecture at 333 Collins Street. This building was almost demolished in the 1970's to make way for 'progress'. 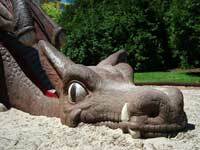 Are your kids brave enough to slide down this dragon in Fitzroy Gardens?! 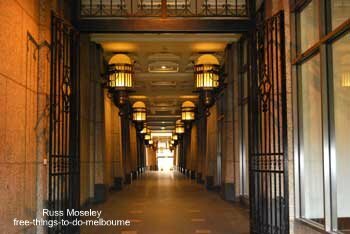 An attractive passageway of lights at 333 Collins Street, Melbourne. 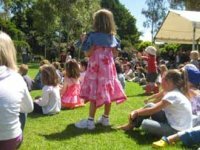 Wander around the University of Melbourne campus and have a look at the variety of buildings and 23 art exhibits. 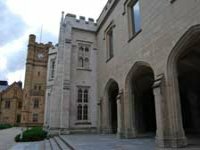 This cathedral is worth a look inside for it's very attractive stonework. 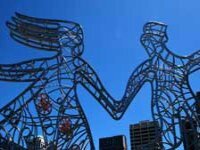 This couple are part of a moving artwork on a bridge across the Yarra River behind Flinders Street railway station. 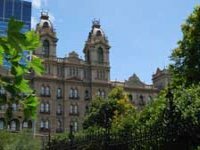 The Windsor Hotel is Australia's only surviving grand 19th Century City Hotel. 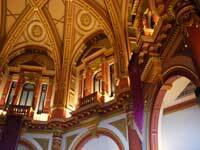 Take a look at the ballroom. 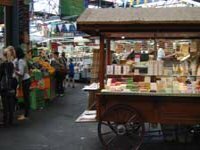 A lovely market with the bonus of activities available for the kids. 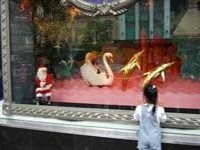 Have a look at the Myer Bourke Street store's famous Christmas window display.